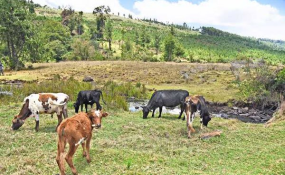 Cows graze near a stream in Talal, Elgeyo-Marakwet County near the site where the Kimwarer multipurpose dam is supposed to be constructed. Maragua Constituency in Murang'a County is often hard by water shortage and often suffers cholera outbreaks. This despite the fact that the constituency boasts of over 10 colonial era dams whose water is not fully utilised. They include Muli dam in Kambiti, Githanji dam near Kenol town, Gakoigo dam in Nginda, Mariiki dam in Ichagaki, Methi dam, Kimorori and Gatibanga dams among others which are mainly benefit locals who can afford to use water pumps for irrigating their farms. The dams rarely dry up and locals say that only desilting is required to remove mud in order to make them fully useful. The dams have never been rehabilitated since 1963 after the British moved out of the country after Kenya attained independence. Despite the existence of the dams, the national government will spend Sh35 billion to build another dam in the neighbouring Kigumo Constituency which is meant to provide water for irrigation in Maragua. Water Principal Secretary Joseph Wairagu has said that the dam is part of President Uhuru Kenyatta's Big Four agenda aimed at boosting food security in Maragua and Murang'a County at large. But with the 10 colonial era dams still full of water, locals have expressed fears that the mega projects may only aid some unscrupulous individuals to enrich themselves. Mr Kamau Karanja, a resident of Kambiti where Muli dam is situated, said it has clean water which can be piped to homesteads or even their farm for irrigation and wondered why the government has to build a new dam in the region. "If our constituency has no piped water and has over 10 colonial dams, and the government is not keen on desilting them, what will guarantee that the new dams they are constructing will be desilted?" he posed. Murang'a Woman Representative Wanjiru Chege challenged the government to consider prioritising on desilting of the colonial era dams instead of building new ones, saying this will be of more economic value and less time consuming. "Desilting of dams will be of higher economic value to locals and will create employment to the youth as opposed to construction of new dams," she said. Interestingly, the government, through the Ministry of Agriculture, has stocked the dams in Maragua with over 55,000 fish fingerlings in a move aimed at boosting fish farming in the county. According to Mr John Mwangi, the Fisheries Director in Murang'a South, the stocking will boost the community surrounding the dams and will encourage them to protect the dams from encroachment. "We have stocked the dams with 55,000 post fingerlings in a move that will see locals get jobs after fishing and motivate them to protect the dams from encroachment," he said. The Murang'a County government, through the County Executive Member for Water Paul Macharia, said it intends to budget for desilting of the dams in the next financial year.